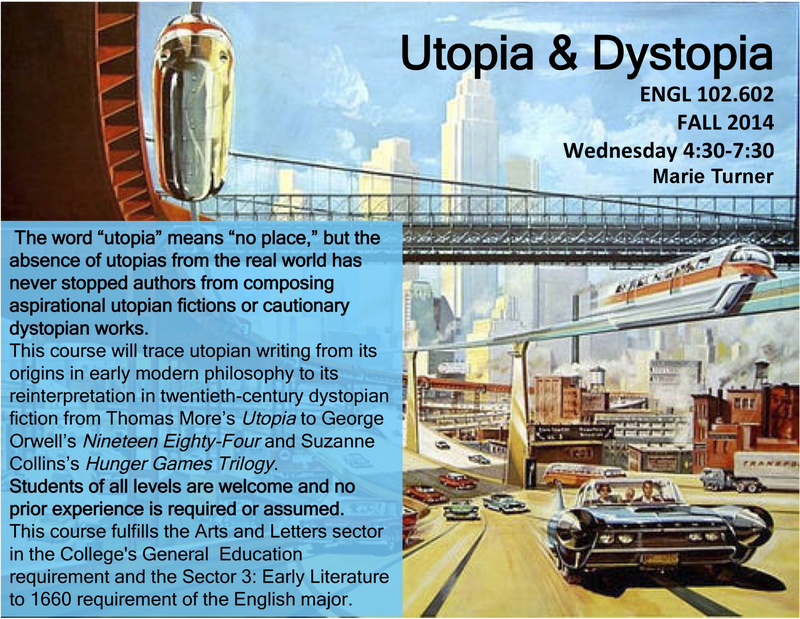 This course will trace utopian writing from its origins in early modern philosophy to its reinterpretation in twentieth-century dystopian fiction. The word “utopia” means “no place,” but the absence of utopias from the real world has never stopped authors from composing aspirational utopian fictions or cautionary dystopian works. In this course we will study political, scientific, and spectacular utopian and dystopian fictions to assess the possibilities and limits of imaginative “no places.” We will read early utopian writings, like Thomas More’s Utopia, Francis Bacon’s New Atlantis, and Margaret Cavendish’s Blazing World, alongside later dystopian works like George Orwell’s Nineteen Eighty-Four, Chang-rae Lee’s On Such a Full Sea, and Suzanne Collins’s Hunger Games Trilogy. The course is designed to develop a critical vocabulary for discussing the formal structures and historical contexts of utopian and dystopian writing, cultivate facility in reading and writing about literary works, and encourage independent and original research. Course requirements will include brief writing assignments culminating in a final research project.